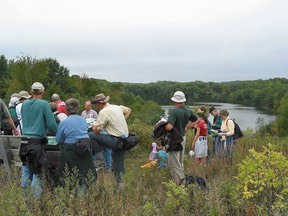 Kent Syverson, professor of geology at UW-Eau Claire, has written a Wisconsin Geological and Natural History Survey Bulletin (#103) and colored map describing the landscape and glacial history of Chippewa County. The publication will help people understand how a glacial geologist gathers and interprets data in order to understand the geologic history "puzzle." The bulletin (which includes a colored 1:100,000-scale geologic map and cross sections) is available from the Wisconsin Geological and Natural History Survey [WGNHS] for $15 plus shipping and handling. This publication would be ideal for people interested in the glacial history of Wisconsin. See http://www.uwex.edu/wgnhs/b103.htm for more information. Unfolded copies of the colored geologic map also are available for purchase. Call the WGNHS Map Sales office for more information (telephone 608/263.7389), stop by their office at 3817 Mineral Point Road, Madison, Wisconsin 53705-5100, or use their order form http://www.uwex.edu/wgnhs/pdfs/orderpdf/order.pdf.